This is an excerpt from Basketball Anatomy by Chicago Bulls team physician Dr. Brian Cole and USA Strength and Conditioning Coaches Hall of Famer Rob Pannariello. Safety tip: You must be able to perform a squat with good technique before attempting this exercise. If you have a history of low back injuries, consult with the coach and a medical professional before attempting this exercise. Stand upright, holding a kettlebell with both hands, arms relaxed in front of the body with the kettlebell between your legs. Assume a wide stance with the feet outside shoulder width and toes pointing slightly out. Squat while keeping the back straight and your eyes and head facing forward. 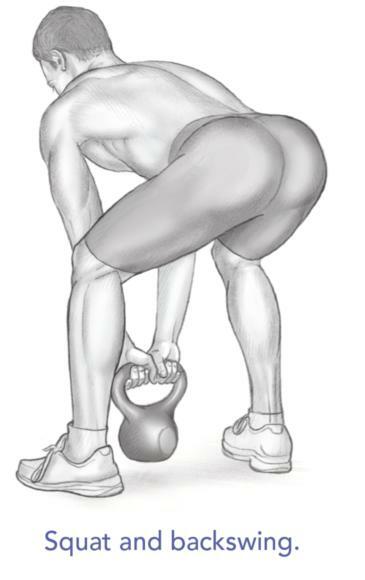 Push the hips back as you descend until the kettlebell is well clear of your groin between your legs. To initiate the swing, press your forearms against your groin as the kettlebell extends behind you. Once the kettlebell has reached its farthest point between your legs, immediately extend the hips upward and thrust them forward. 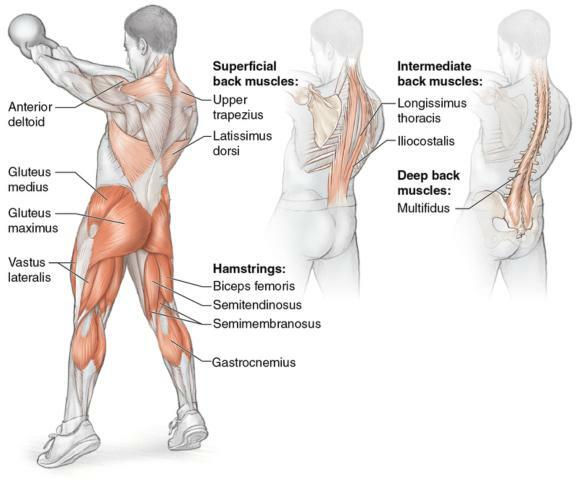 This will cause the back to straighten vertically and the kettlebell to move forward in an upward arc. As the kettlebell moves forward, fully extend the arms until the kettlebell rises to chest height. Do not use your arms to move the kettlebell. Momentum from your hips and legs should initiate all movement. Once the kettlebell reaches optimal chest height, let the kettlebell lower into its arc of motion as you squat down slightly, keeping the hips back and your back in a neutral position. Perform the prescribed number of repetitions. The kettlebell swing is a good introductory exercise for teaching athletes hip thrusting and the triple extension movement pattern (extend at the ankles, knees, and hips) to assist with the teaching progression of Olympic-type weightlifting exercises. The triple extension is an important component of running and jumping. This exercise teaches you to produce higher forces into the floor when running after an opponent or when jumping for a rebound. Good explosiveness on the court enables you to move more quickly and outjump an opponent. 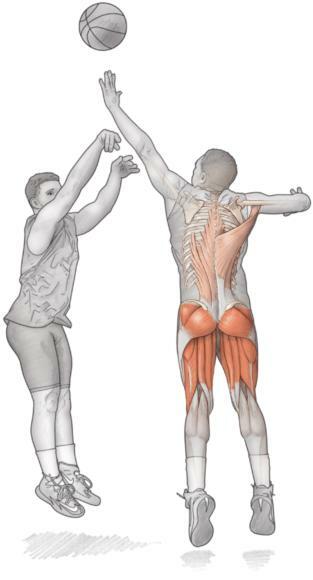 Learn more about Basketball Anatomy.